The Professional Regulation Commission (PRC) on Wednesday, February 18 announces that 594 out of 832 (71.39%) passed the Physician (Medical Doctor) board examination given by the Board of Medicine in the cities of Manila and Cebu this February 2015. PRC named Far Eastern University (FEU) - Nicanor Reyes Medical Foundation as the top peforming school in the February 2015 Physician Licensure Examination as per Commission Resolution No. 2010-547 series of 2010. 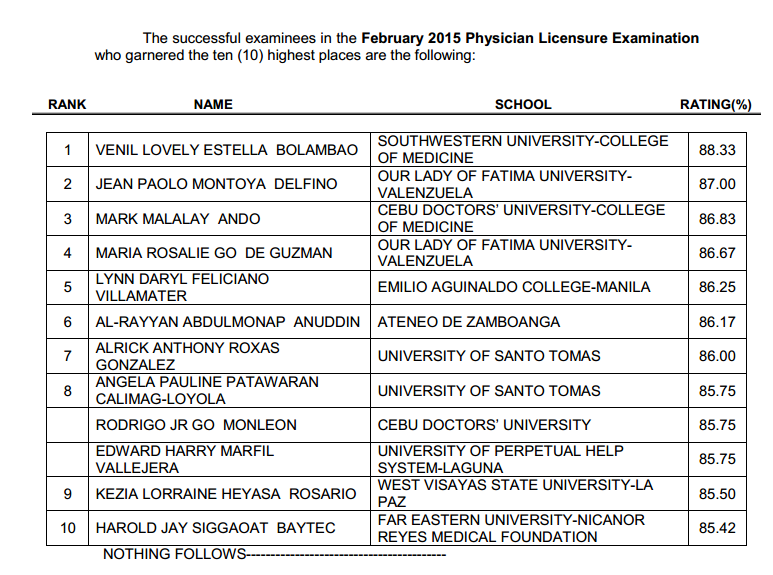 FEU-NRMF got 93.64 passing percentage or 103 out of 110 passed the exams. Venil Lovely Estella Bolambao from Southwestern University (SWU) - College of Medicine topped the board with 88.33 percent average grade.